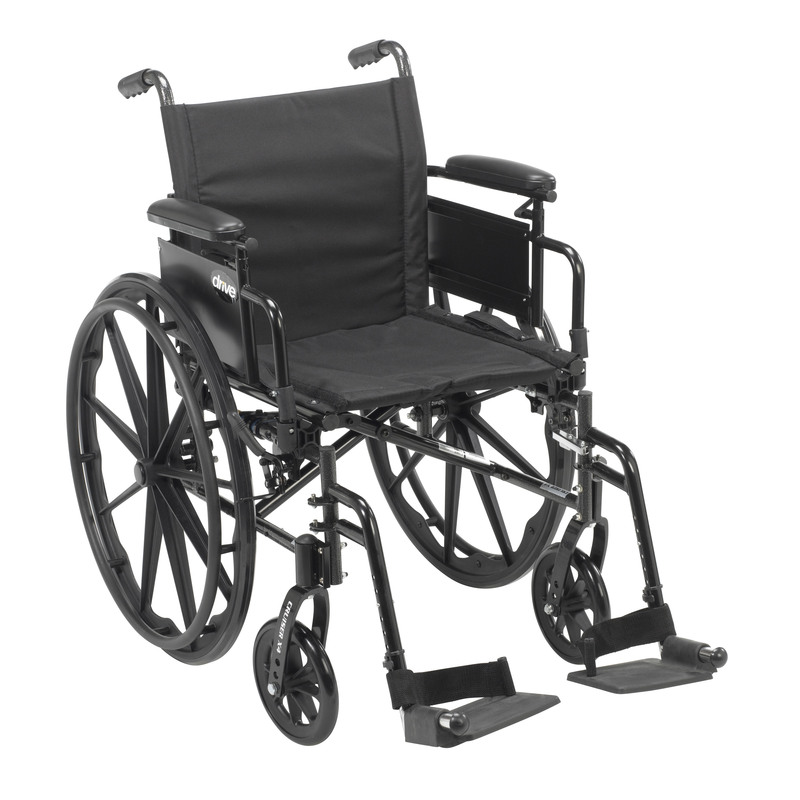 Cruiser X4 Lightweight Dual Axle Wheelchair with Adjustable Detatchable Arms | Mountain Aire Medical Supply, Inc.
Don't let mobility challenges keep you from getting out and experiencing all life has to offer. For many people, a manual wheelchair is the ideal solution to maintaining mobility independence. Manual wheelchairs are among the most commonly used mobility devices thanks to their versatility, functionality, ease of transport and low maintenance. The Cruiser X4 from Drive Medical offers all these features and much more. The Cruiser X4 is ultra-lightweight, yet extremely strong thanks to its aluminum and carbon steel frame which is specially designed to allow for custom seat backs and accessories and includes our patented adjustable-depth seat. The rear wheels can be quickly and easily moved between three separate axles to adjust the seat to the ideal height for the user or to angle the seat back. Other comfort adjustments include armrest height, seat back height and the height and angle of the front caster wheels - all allowing you to tailor the Cruiser X4 to your specific needs. The Cruiser X4 also offers push-to-lock wheel locks to make locking the rear wheels easy - even for those with less hand strength. The Cruiser X4 is available with swing-away footrests and adjustable height detachable desk arms. Patented adjustable depth seat from 16"-18"
Back of Chair Height: 16"-17.5"
Folded Dimensions: 43" x 12" x 36"
Seat to Floor Height: 17"-19"